After a pretty miserable start to the year the last week has seen us experiencing some good, warm, weather, with blue skies and sunshine. Having been stuck indoors for most of the week I decided to take Friday afternoon off and get out in the fresh air for a walk. 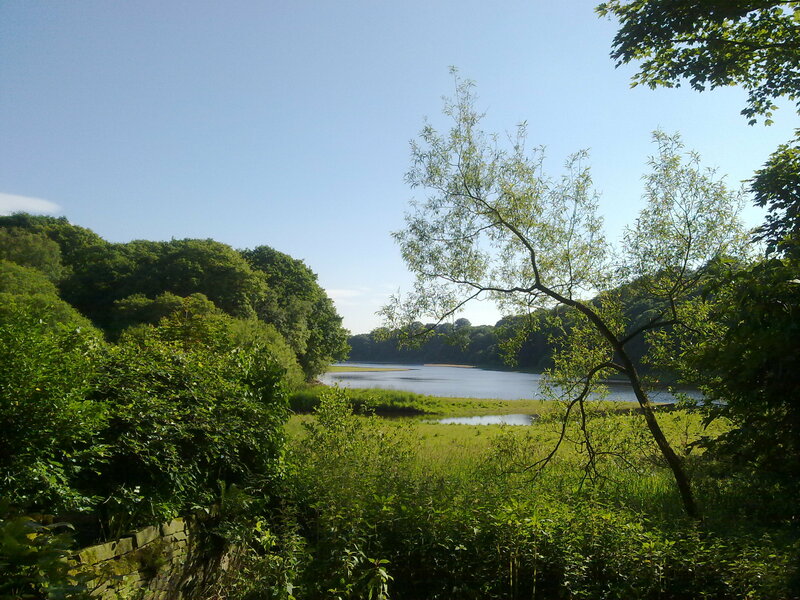 I didn’t want to stray too far so drove the eight miles or so over to Anglezarke, to go for a walk on the moors that have been my stomping ground ever since I was a young teenager. 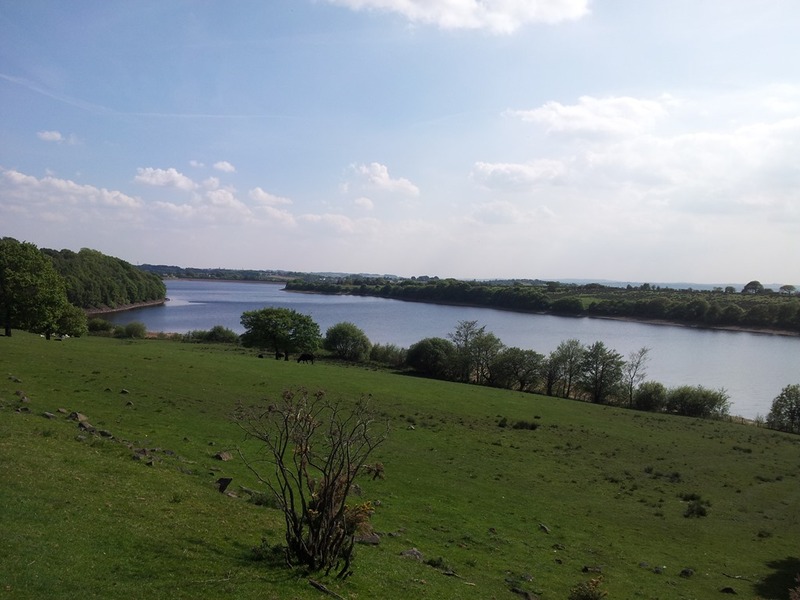 I parked up at the viewpoint overlooking Anglezarke reservoir and walked the short distance up the road to Jepson’s Gate where I was able to gain access to the moor. 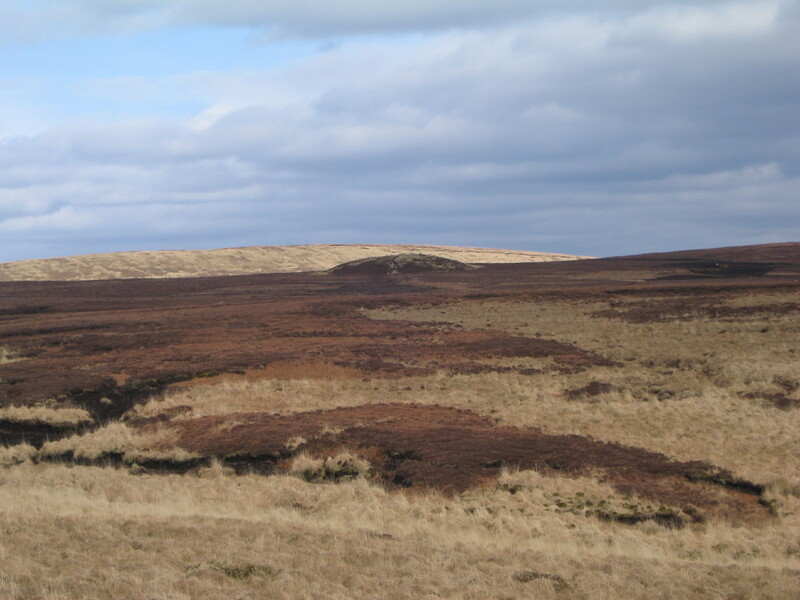 Despite being surrounded by some significant towns the West Pennine moors wild and remote. 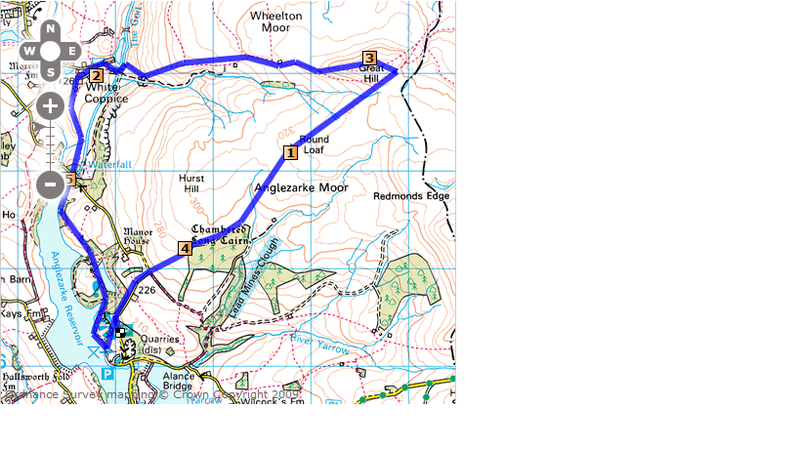 I did a favourite circular route of about 6 miles which toko me 3 hours including 3 short stops. 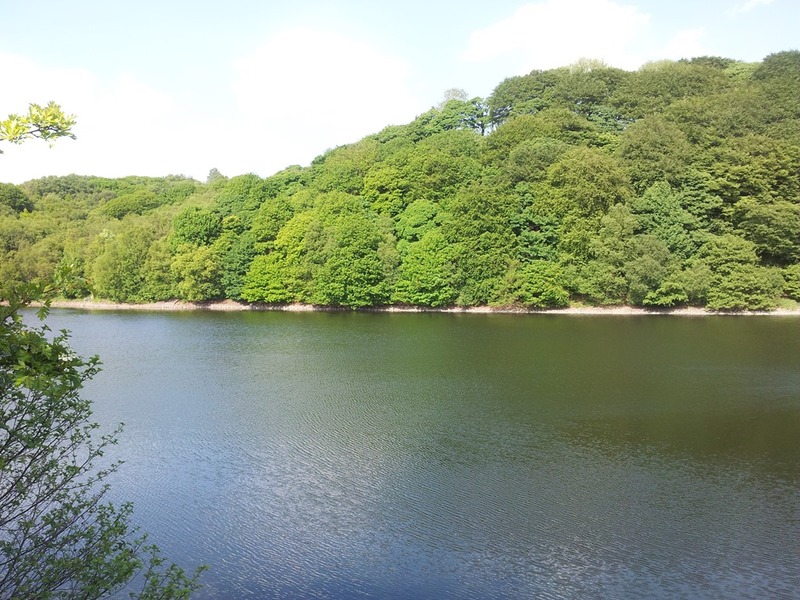 It’s a mix of wild moorland and a walk through woodlands along the reservoir at Anglezarke. 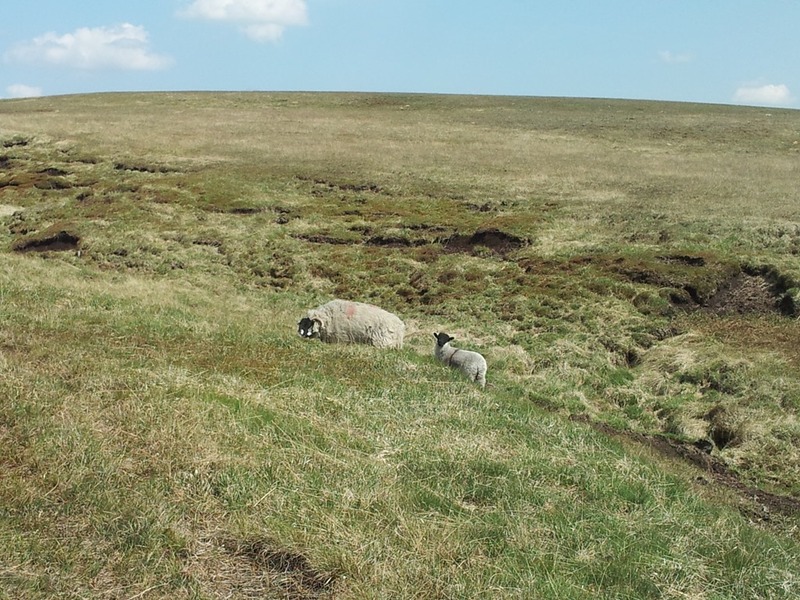 While I was up on the moor I only passed 2 people coming the opposite way but saw three curlews, a number of skylarks and plenty of sheep. There were more people around when I descended back into the valley to walk along the reservoir. 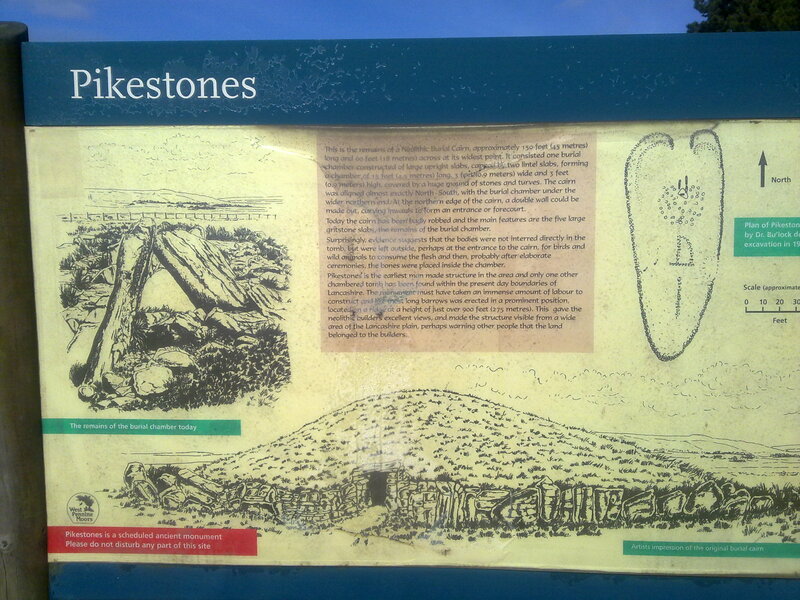 I cut across the open access path over to Pikestones, the ruins of a Neolithic long barrow. It can be heavy going across the peat, especially as there isn’t a properly defined path, but as there’s been very little rain of late it was quite dry underfoot. I then cut across the moor heading towards Round Loaf, a Neolithic round barrow which is a dominant feature on the relatively flat moorland landscape(there are a number of prehistoric remains on the moors here). my next destination. I cut across the moor trying to follow an indistinct path. Fortunately it was dry underfoot as the peat can be quagmire. There were a few ditches and rivulets that had to be traversed. I climbed up towards the summit and took another short break while taking in the views. 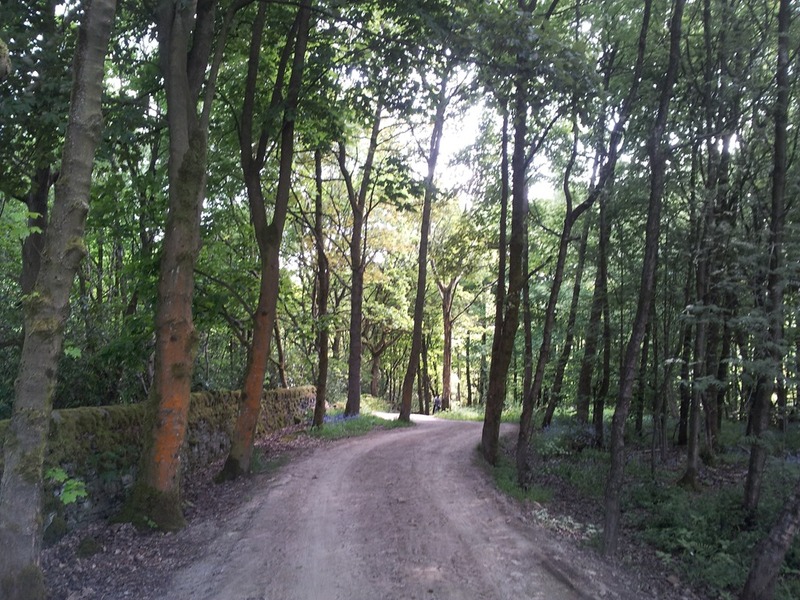 Then I walked along the ridge and took the path that would lead down to White Coppice. 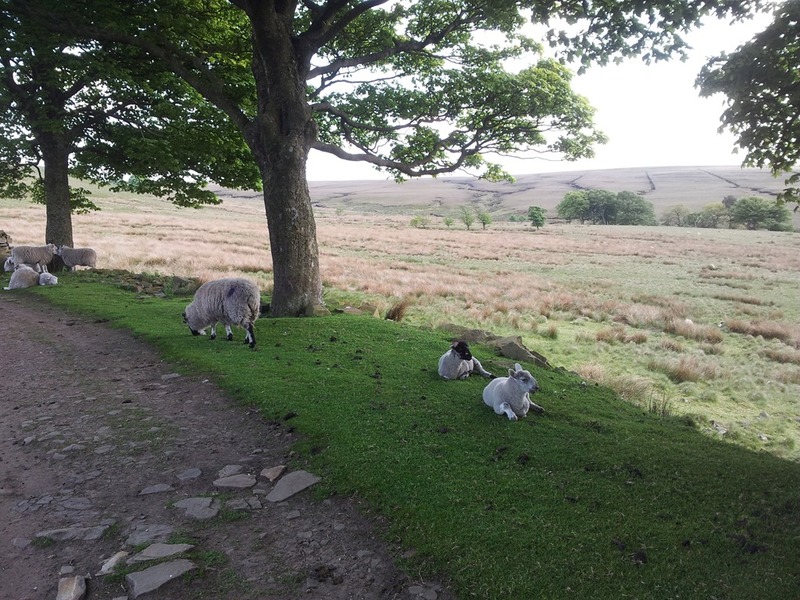 I passed the ruined Drinkwaters farm (it must have been a difficult life living up here) whose only residents were sheep sheltering in the shade. Then it was a short climb up the hill back to the viewpoint to rejoin the car. 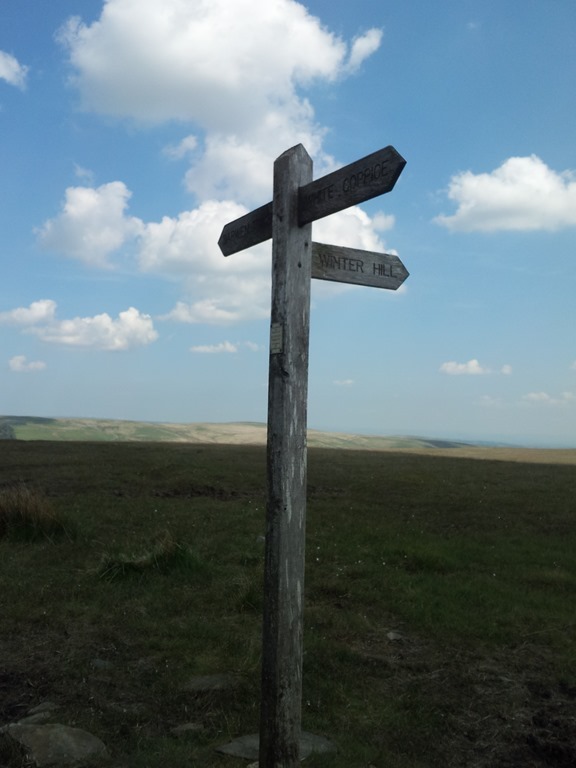 The weather has been too good this week to stay in the office, so I decided to take a few hours off Tuesday afternoon and get up on the moors to clear my head. When I was a teenager I used to spend hours up on the West Lancashire Moors and knew them like the back of my hand. Although they’re surrounded by industrial towns they’re wild and isolated and a good place to find some solitude. I didn’t go up there for a long time, but over the last few years have started to rediscover them. 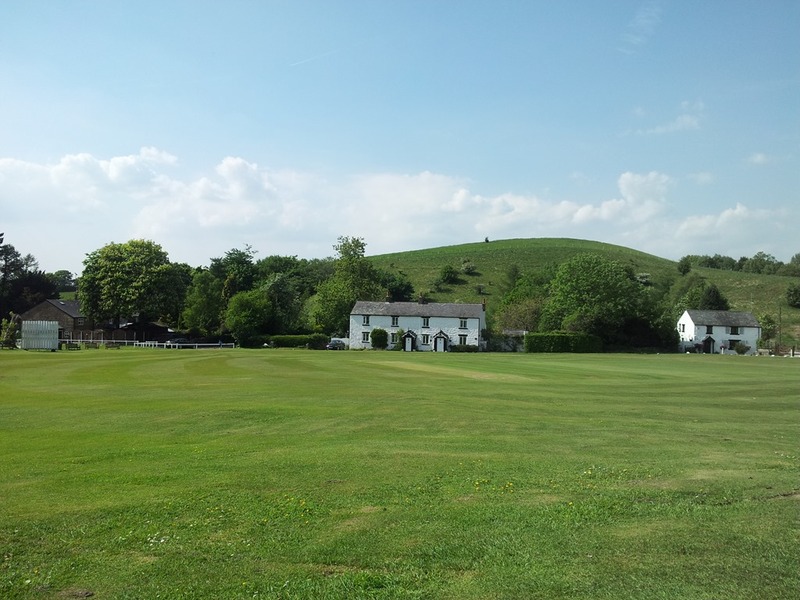 This walk is one of my favourites taking in different types of terrain, wild moors, farmland and a lakeside path, a picturesque hamlet and one of the most dramatic locations for a cricket pitch in England. I parked up at the viewpoint above the reservoir. 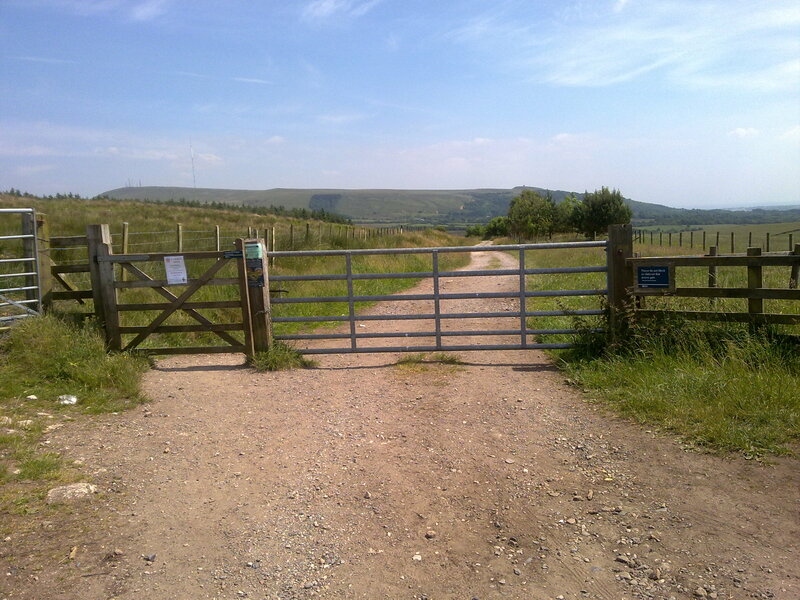 I walked along the road as far as Jepson’s gate and climbed over the stile on to the open access land and headed over the rough ground towards “Pike Stones”. The ground was dry – quite different to the last time I visited the Neolithic monument in the early Spring when it was sodden underfoot. 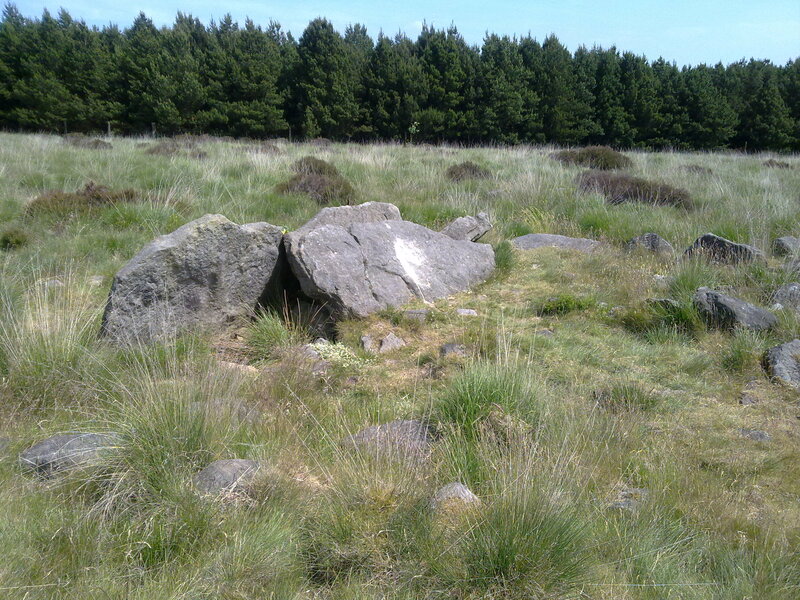 Pikestones is a collection of stones that used to be a Neolithic burial mound. 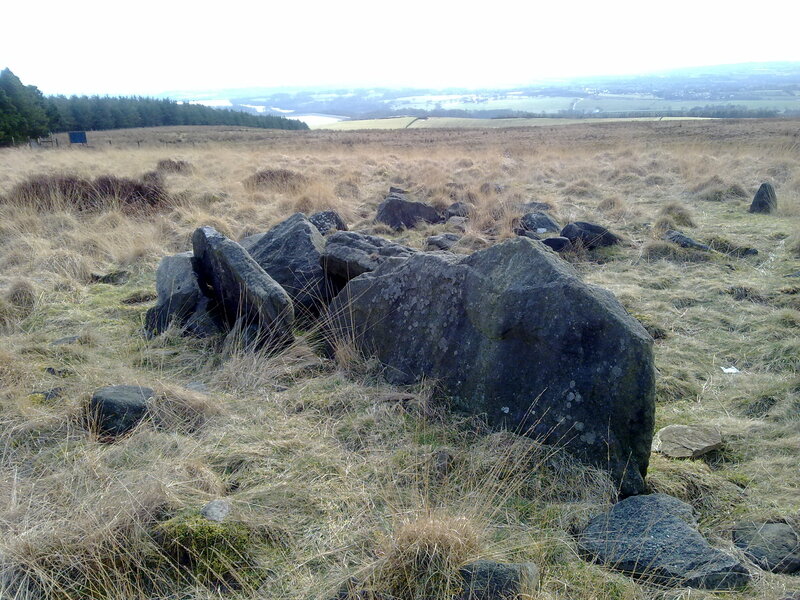 There are several large slabs of millstone grit which at one time would have stood upright to form a burial chamber. 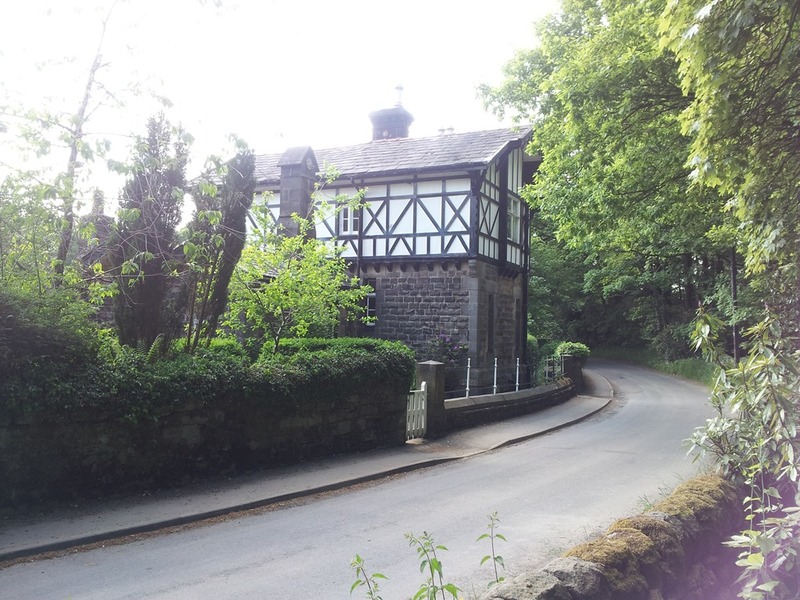 It’s a scheduled Ancient Monument. There’s an information board about the site with an artist’s impression of what the burial mound may have looked like when it was built. Leaving the site I took the path at the back of a plantation of fir trees and then cut across the moor towards “Round Loaf”, a Neolithic or Bronze age Tumulus, or burial mound, which dominates the flat moorland. It’s situated on open access land and the peaty ground going can be really difficult after wet weather – but this time it was dry underfoot. Nevertheless, it was still hard going at first as the ground is rough and there was no distinct path until I got nearer to the tumulus. 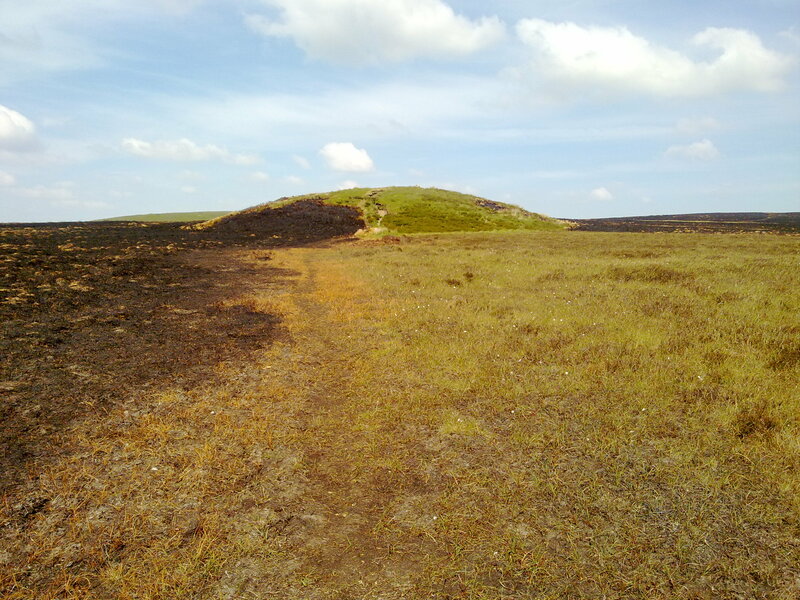 There were extensive areas of blackened grass on the moors and even part of the western side of the mound itself was scorched. 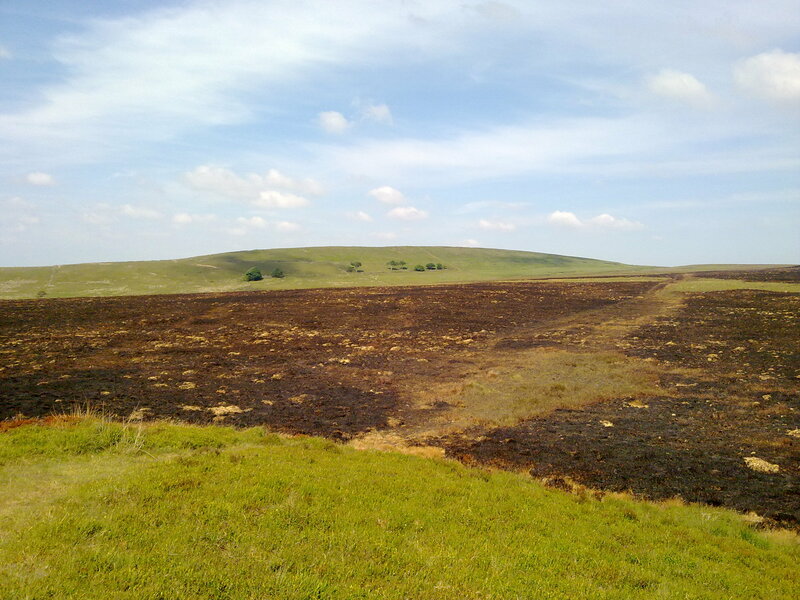 Standing on top, I could see that the grass over to the east was still on fire but, fortunately it was smouldering rather than properly ablaze. Standing on top of the mound I had a good view of Great Hill ,Winter Hill and the surrounding moors, but the atmosphere was very hazy. It wasn’t even possible to make out the coast at Southport. 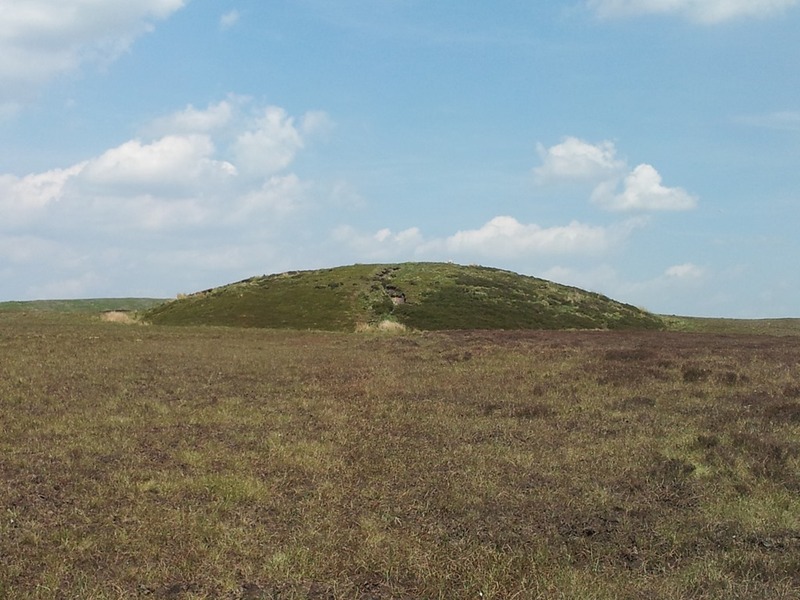 The tumulus is in such a dominant position high on the moor that on a good day most of the Lancashire coast is visible and it’s possible to see as far as the mountains in three National Parks – the Lake District, Yorkshire Dales and Snowdonia. After a short break I set off again across the moor towards Great Hill and then climbed to the summit. 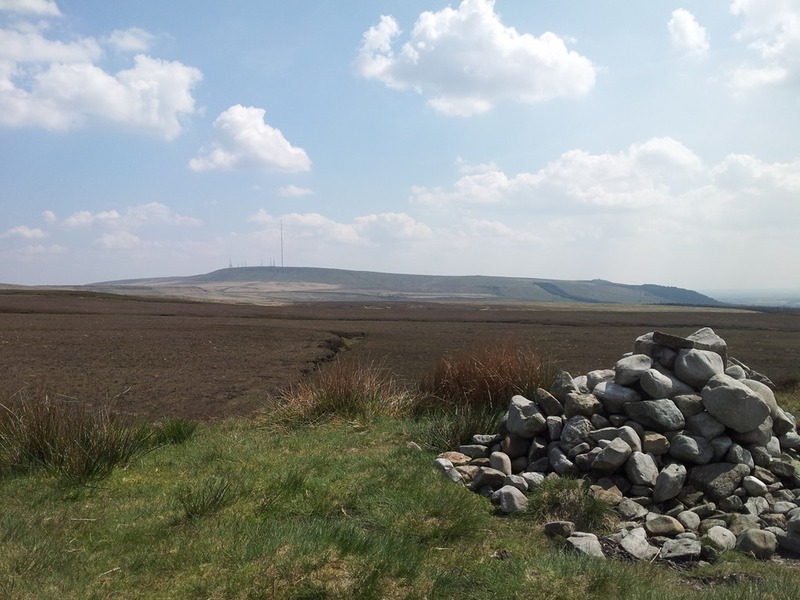 which is the highest point on this part of the moors. Again there were great views of the surrounding hills and moorland, but long range visibility was poor. Although it can get busy on nice weekends, mid-week, even on a nice day, it was fairly quiet. It can be windy on the exposed top, and a shelter has been built to protect walkers who reach the summit on blustery days. I stopped for a while to take in the view and some refreshments before setting off down the hill towards White Coppice. On the way down I could hear the bubbling sound of a curlew and looking up could see it circling over the moor. 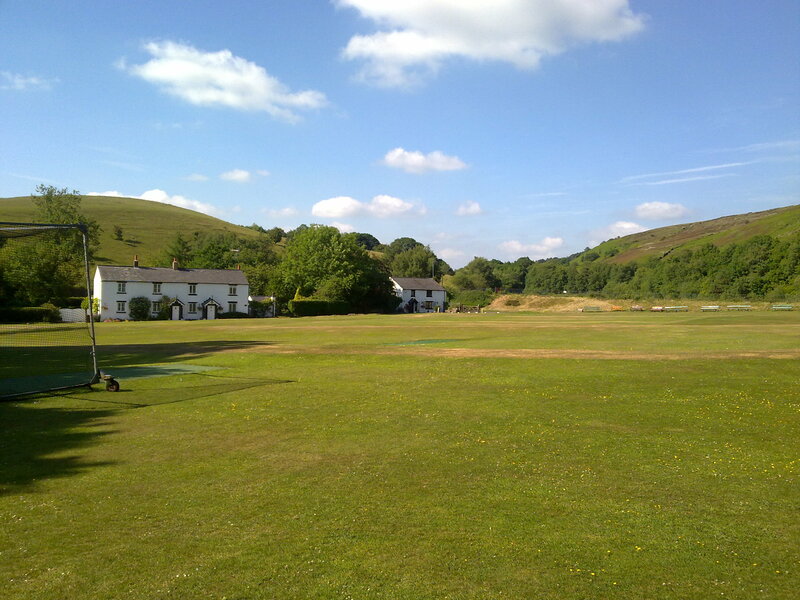 White Coppice is a picturesque hamlet with a cricket pitch nestled at the foot of the hill. 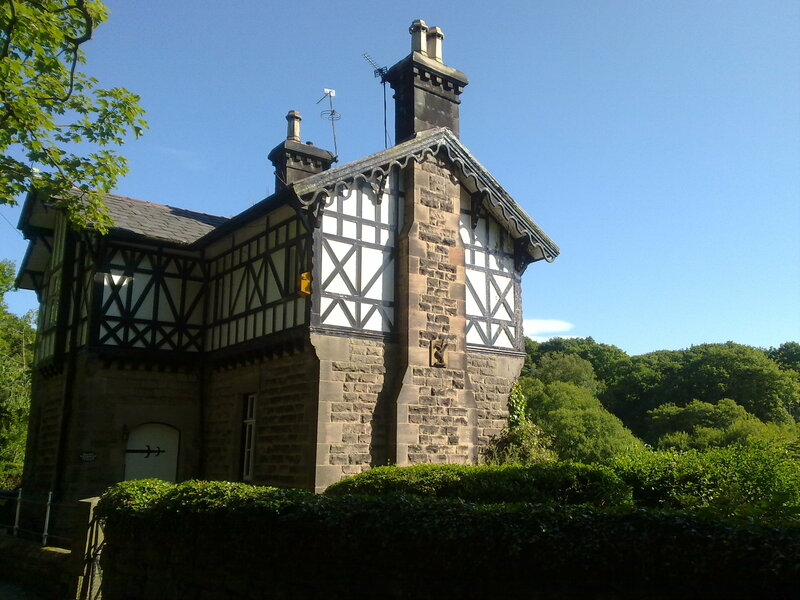 It has an industrial past though, owing it’s existence to lead mining and quarrying in the nearby hills. 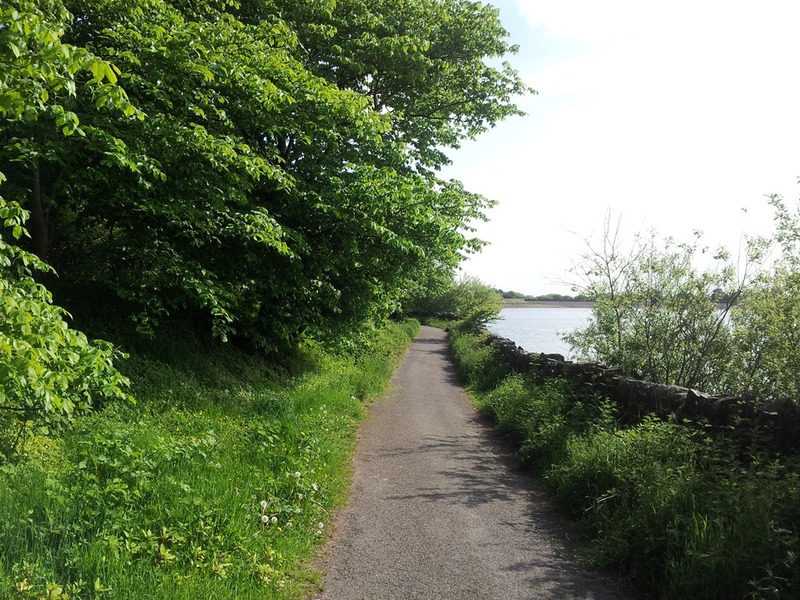 From White Coppice I took the path over the fields and along the river to Waterman’s cottage at the bottom of Anglezarke reservoir – one of a string of reservoirs created to supply water to Liverpool. I made my way along the east side of the reservoir and then climbed the hill back to my car. I’ve saved a map of the route here. Spring is in the air at last and as it was a reasonable day and I didn’t have much else I desperately needed to do I decided to go out for a walk. 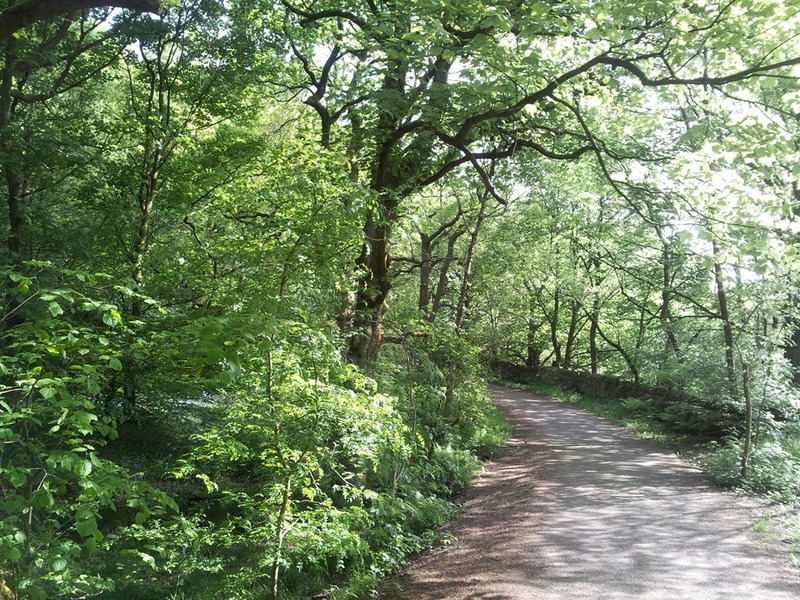 A short drive, park up the car and put on my boots and then I was heading towards Anglezarke Moor, a favourite haunt of mine since I was in my teens. 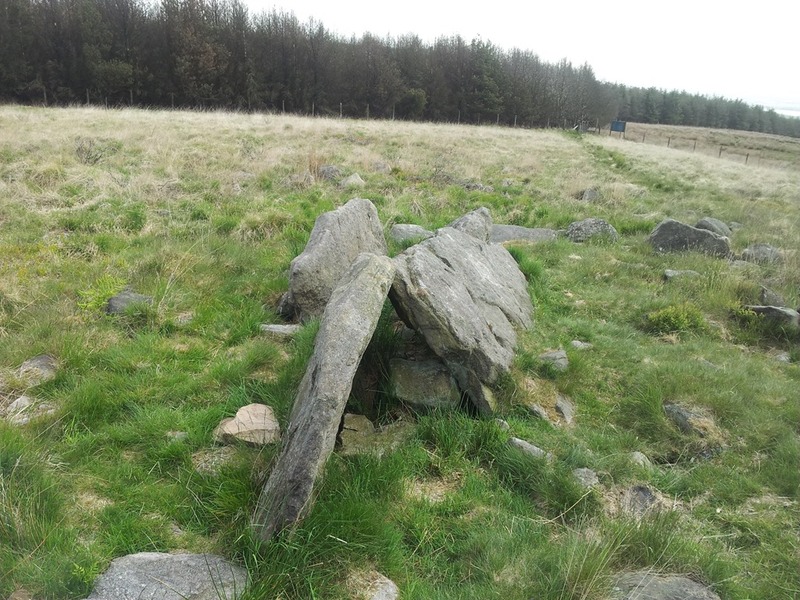 Last year when we went on holiday to Pembrokeshire we saw quite a few prehistoric dolmens – standing stones – which are the remains of prehistoric burial mounds. 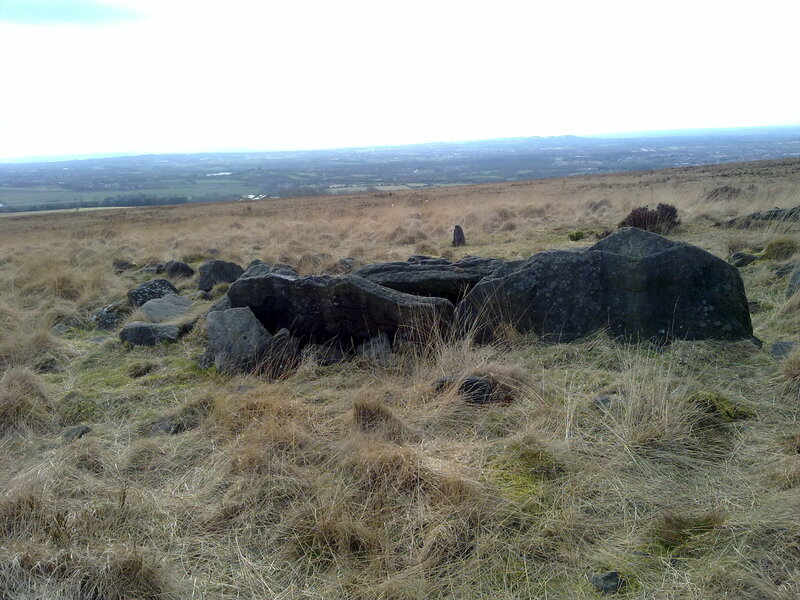 Anglezarke also has a number of prehistoric sites so I decided to base my walk on them. The stones themselves don’t look much, but it doesn’t take too much imagination to picture what they looked like when they were upright. Of course, originally they would have been covered over with earth to form a mound and the stones themselves wouldn’t have been visible. However, the mound must have been a fairly impressive sight when it was standing, especially given the prominent location on a high ridge. Standing by them today there was a reasonably clear view over the west Lancashire plain right down to the sea, which was just about visible. Sadly some idiot has defaced one of the main stones, carving in some sort of symbol – this, in turn, has now been defaced. 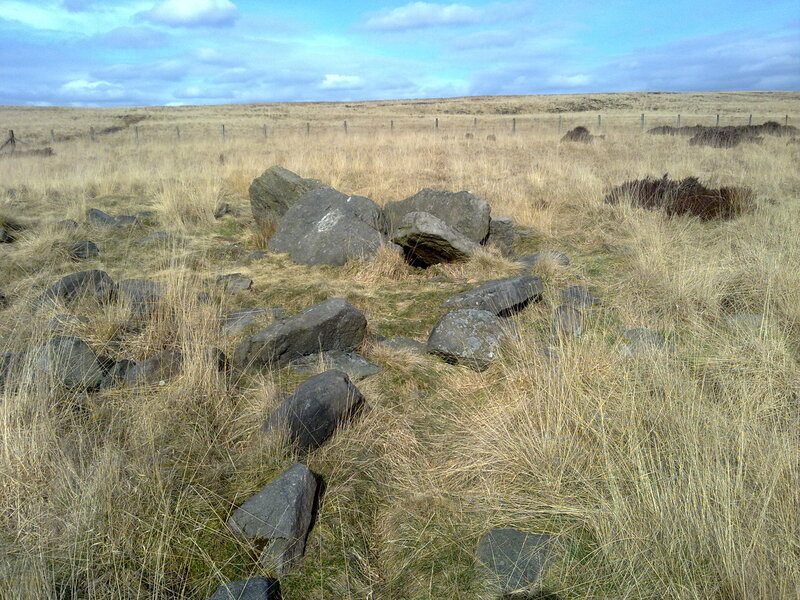 A short distance away, over the moor, there is another prehistoric relic – “Round Loaf”, which is a Neolithic or Bronze age Tumulus, or burial mound. 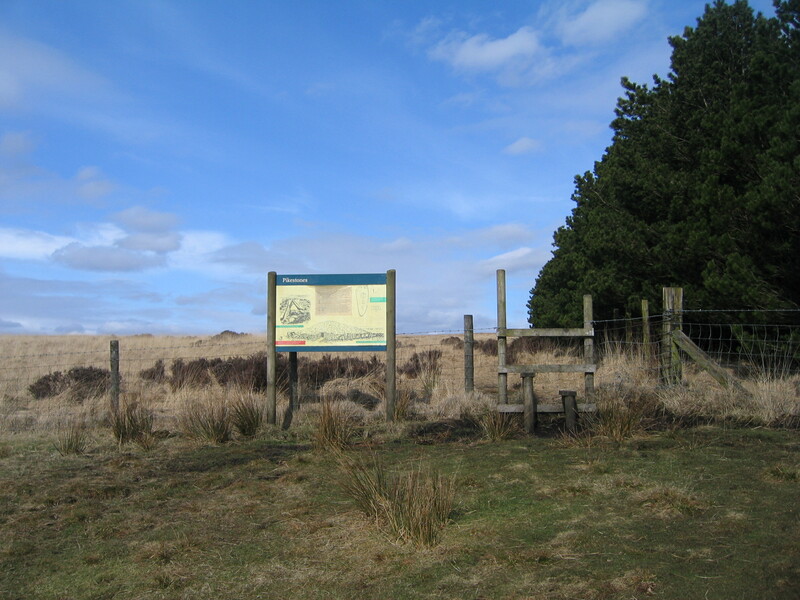 It’s constructed on top of a flattish area of the moor so that it stands out and is visible from quite a distance away, silhouetted against the horizon, particularly when viewed during a walk up to Great Hill from White Coppice, when it stands out against the sky. 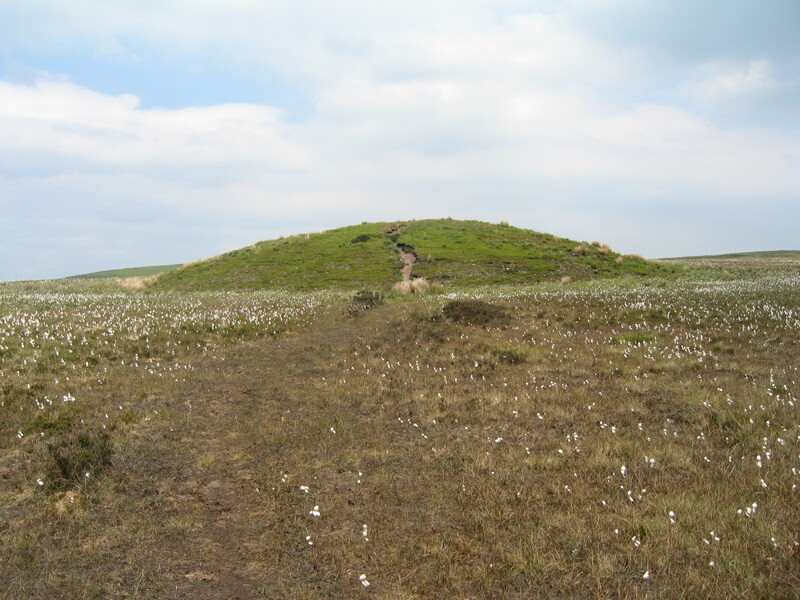 Its the largest example of a round barrow in the north west of England and, because of its remote location, its never been excavated. I didn’t trek over to the tumulus today. 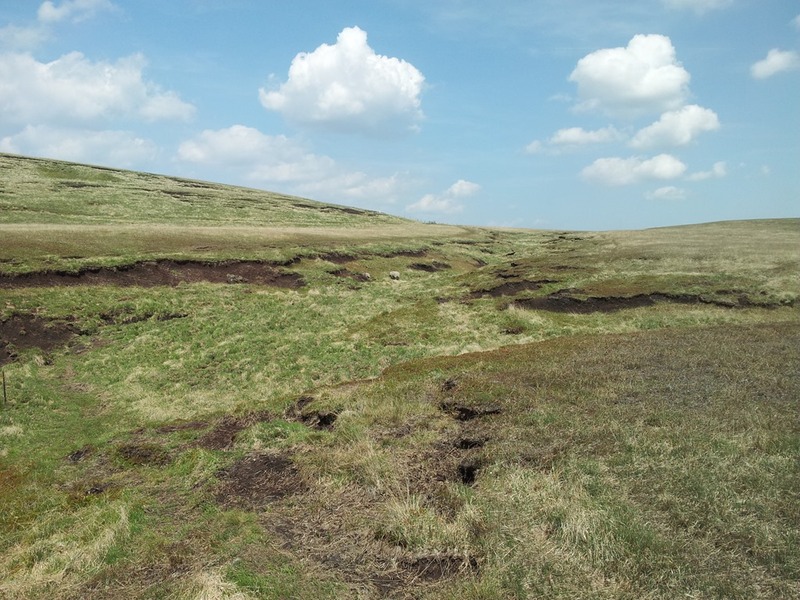 It involves yomping over the peaty moor and conditions underfoot weren’t that great. It’s worth it on a good day, though, as if you are lucky there are magnificent views. 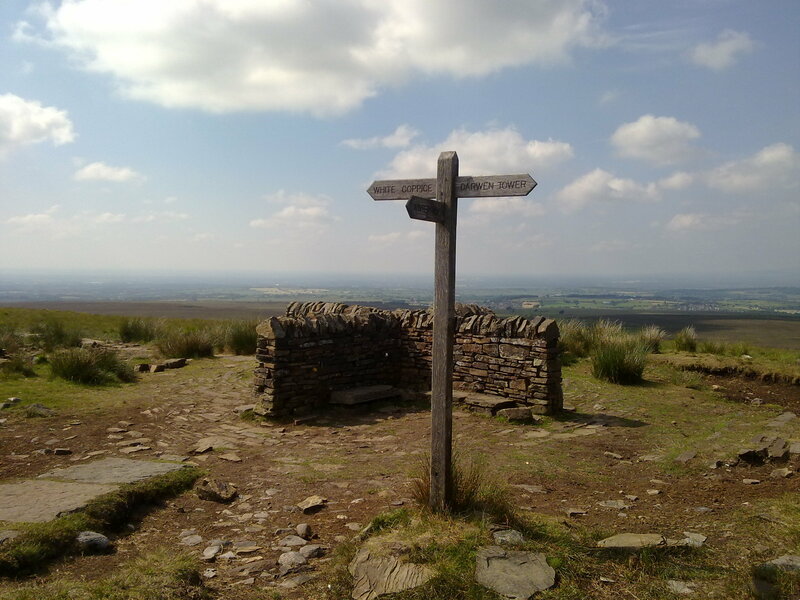 One particularly clear day, standing on top of the tumulus, as well as views of the West Lancashire Moors and the Liverpool Bay I was able to see the mountains of three national parks – the Lake District, the Yorkshire Dales and Snowdonia.